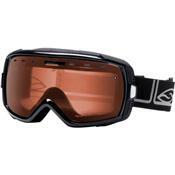 Smith designed the Heiress Polarized Goggle to set the standard for women-specific goggles, whether you're a millionaire's daughter or are waiting tables to pay for your lift ticket. Get crystal-clear, glare-free vision during bluebird days or overcast skies with the spherical, polarized Carbonic-X lens, and fear not the fog with Smith's Vaporator lens technology and Regulator lens vents. A QuickFit strap adjustment and Articulated Outrigger Positioning System give you a precise fit with or without a helmet.